1) Automatically populate any new dungeon from any mod or dlc, even if a patch for Genesis has not been created. In the beginning, there was emptiness. . . and from this void came forth vile, from the disobedience of a single man. His wickedness took place in the form of betray and lies, and his actions would spread a dark curse over our promised land. A standalone add-on module for our Sands of Time: Ultimate Deadly Encounters mod. The mod is extremely lightweight and provides populated dungeons on the fly; this "Unleashed version of Genesis works with ALL DLC content and ALL modded dungeons as well. For those that care to know: this feature at one point was included within the full Sands of Time (SoT) mod, but due to popular demand, we created a separate standalone module just for Genesis and gave it a mod of its own. After doing so, we hit the hotfiles almost instantly (which was awesome!). The mod then received plenty of attention which lead to more feedback coming in and more suggestions on how to expand and enhance this feature. Ultimately, the Genesis mod became more advanced than the Genesis system that was built into SoT. For simplicity sake, we have decided to divorce this feature from our main mod entirely which will allow us to upgrade it easier and also to create the various patches requested (for Monster Mod and SIC) without the need to do double work. We felt that this will be better / easier for us as well as you. So, we wish to say "thank you", to everyone that has helped us make this standalone feature into a full, and wonderfully dark mod all on its own. As for how Genesis Unleashed came about: The original Genesis was well received and is still up and running on all platforms. SE version is here. Lets call that version 1.0 . To work , it used a single skull per dungeon to run the single script that populated the dungeon with hostiles and loot. This required cumbersome patches to make it work with new dungeons from mods or DLC size projects like Beyond Bruma--way too much work. To solve this, Genesis 2.0 was born! Automatically populate any new dungeon with appropriate location based enemy NPCs from any mod or DLC, even if a patch for Genesis has not been created. Beyond Bruma compatible. Its the reason we made this--Bruma dungeons area walk in the park / cake/ too easy if you are used to SOT dungeons. This will fix that. New toggle added to menu book to decide if new dungeons are auto populated or not. Step 1) Backup your save game in case you wish to uninstall the mod at a later time. Step 2) Download and install with your preferred mod manager. The mod is compatible with everything. Further, for users already playing with SoT, this will enhance your dungeon play-throughs even more! (Both work together nicely.) 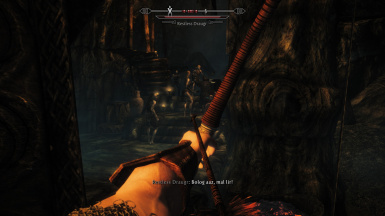 The mod is fully compatible with other mods that add in encounters such as ASIS (just make sure your PC can handle the extra load) and mods that add extra treasure such as Dynamic Loot.